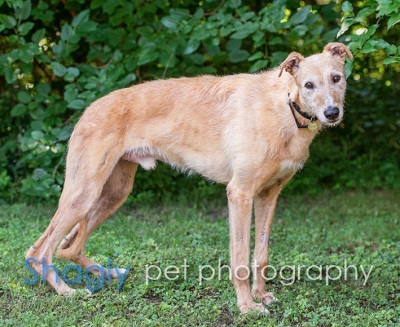 Harley is an estimated 7 year old fawn staghound male found as a stray in Nowata, OK by animal control. It is speculated that Harley is part of a population of an out of business coyote hunter. As you can see Harley has had serious previous trauma to both his rear legs, specifically the Achilles tendons, which are suspected to be severed . He does not appear to be in any pain at all, despite his strange gait. Harley is a large boy, weighing in at almost 100 pounds. 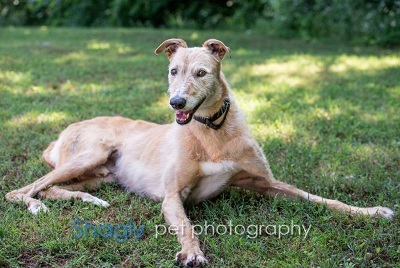 Harley's DNA test results identiified greyhound/greyhound-borzoi-mixed breed genes in his mix. Harley is not cat tolerant. View Harley's DNA test results here. Harley is a BIG fuzzy teddy bear of a staghound, weighing in at just over 100 lbs! This is a guy who does not know his own size or strength. While Harley is generally calm on a walk, he is definitely a strong fella when he sees something interesting like a squirrel or cat. Harley thinks he’s smaller than he is – he sleeps mostly on dog beds of varying sizes and has recently discovered how comfortable a couch can be! Honestly, any place he can lay his big ol’ head is perfect! He jumps into and out of car easily and rides nicely in the car. In summer, Harley loves to play in a kiddie pool just to lounge around and cool off on a hot day. Now getting his fuzzy locks dried off may take a little time! Due to his size, finding a sturdy sizable crate can be a challenge. He has free roam in his foster home, though he has marked inside. Harley would do well with a family that is home a lot to let him out, or one with a (large) dog door. He enjoys short walks with a harness so he can work on his walking manners. Harley will give a gentle tail thump once he starts feeling comfortable, and will 'ask' for affection. Because of his age and condition of his hind legs, Harley is on joint support and pain meds. A house without stairs is preferred. He has a good appetite and politely stays away from the tempting kitchen counters. Harley LOVES squeaky toys! He plays with them nicely and won’t destroy them. Harley is a sweet older boy looking for a home of his own, as an only dog where he can be the center of attention and absorb all the love you can give. If you have a nice yard, a kiddie pool and toys – you will make his life complete.